The Ionath Krakens is a Galactic Football League (GFL) team around which the main storyline of both The Rookie and 'The Starter revolves. Daniel O'Brien's take on the Ionath Krakens in action. Ionath has the distinction of being the only Quyth Concordia team to win a Galaxy Bowl, which the Krakens did in 2665. Historians still consider that Ionath squad to be possibly the best team in the history of the league. Sadly, that season was followed by no league play from 2666 to 2668. The Krakens returned to tte title game in 2675, but lost Galaxy Bowl XVII to the Jupiter Jacks. Ionath fell to Tier Two from 2677 to 2682 and returned to Tier One in 2682. The team is owned by Gredok the Splithead who is also a well known Quyth Underworld Boss (Shamakath). The head coach is Hokor the Hook-Chest who is also of the Quyth race. After a successful 2682 Season the Ionath Krakens were elevated to Tier 1 after the Krakens 28-to-17 victory over the Texas Earthlings in the Tier 2 championship tournament. As a result of injuries and retiring players, the Krakens were forced to make adjustments to their line up. 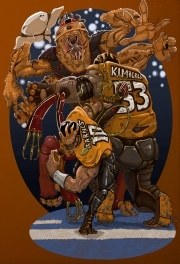 In a controversial but necessary trade, the Krakens Traded the veteran receiver Scarborough and up-and-coming rookie Denver to the Jupiter Jacks to fill a critical offensive shortfall at right guard as both veterans Wen-E-Daret and Aka-Na-Tak were severely injured in the semi-final against the Texas Earthlings. The Krakens Jersey Fan Gallery is a tribute to the fans who have shown the ultimate allegiance to the Ionath Krakens team. These dedicated fans have spent their hard earned cash on acquiring an official Krakens jersey to show their undying pride in this talented team. This page was last modified on 31 August 2016, at 16:29.